Like the last couple of years we rented an apartment at the Rena Fishing Camp and we were Gunnar, Henning, Anders, Lise and I. We also knew that Henrik would be there as he was supposed to guide now and then. 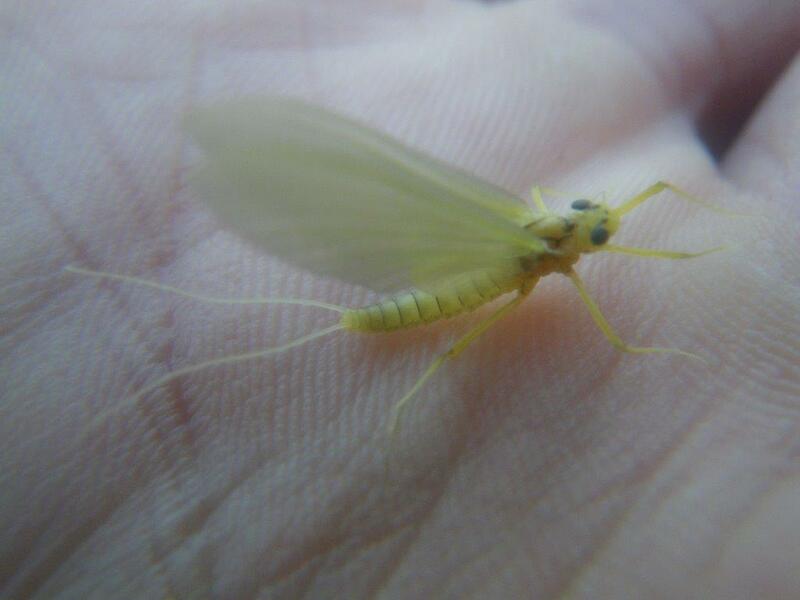 But a week with dry fly fishing from a drifting pontoon boat is something I always look forward to. This will be a sparse post as I did not take many photos. We knew from Henriks reports that the water level was low but we were not prepared for how much this changed the river. The level was 5 feet below normal and that made it much easier to wade fish what normally is quite challenging and all our normal hotspots for fish were dry. 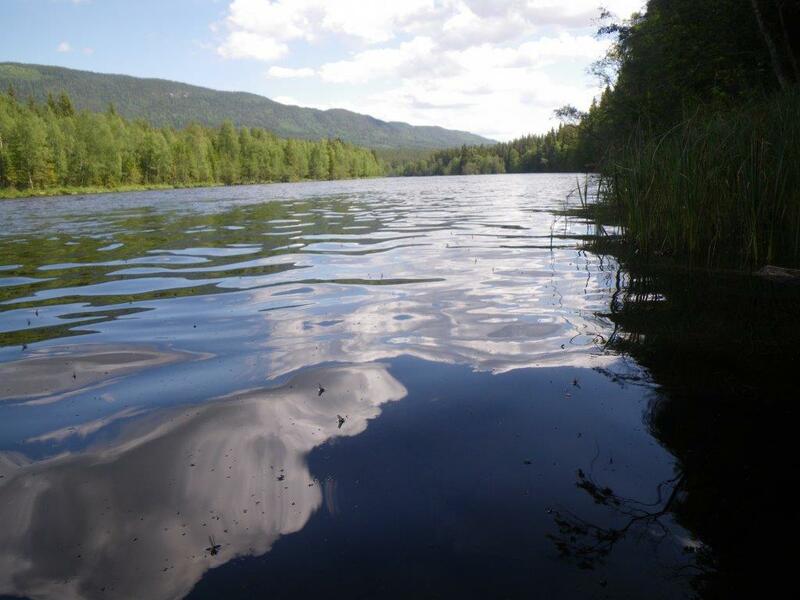 As the water come from a deep lake the water temperature was actually low around 14 degrees Celsius so in contrast to a lot of other rivers the fish were actively feeding and there was no problem with fishing C&R. 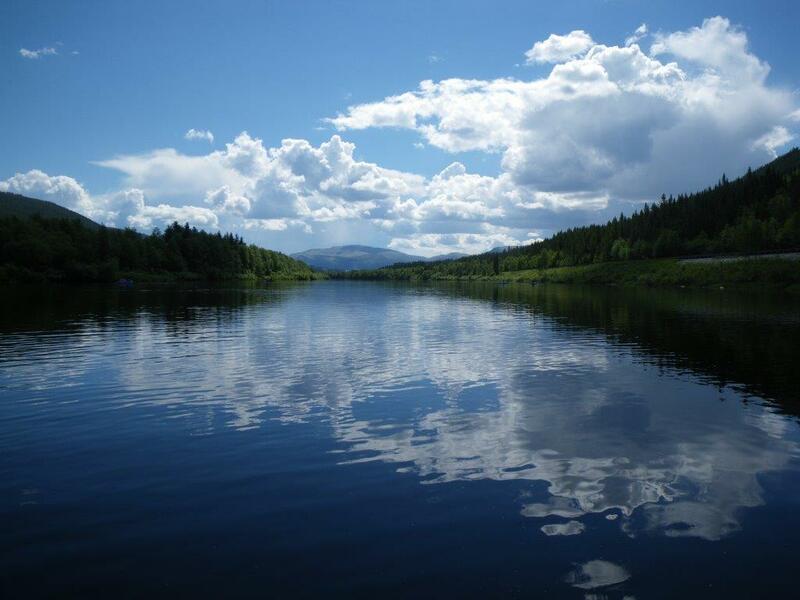 If the water temperature hits 20 degrees the fishing will be closed. The air temperature were 26-30 degrees during our stay so we fished mainly in the evening and as the soccer world championship was running we also spent some time watching this. 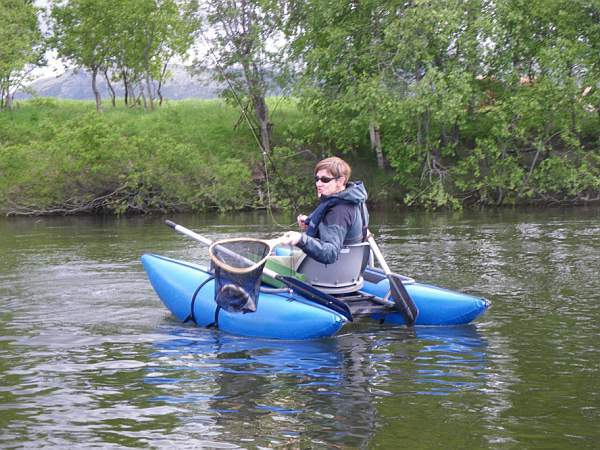 I mainly aimed for the trouts and everyday we got some nice and strong fighting fish. 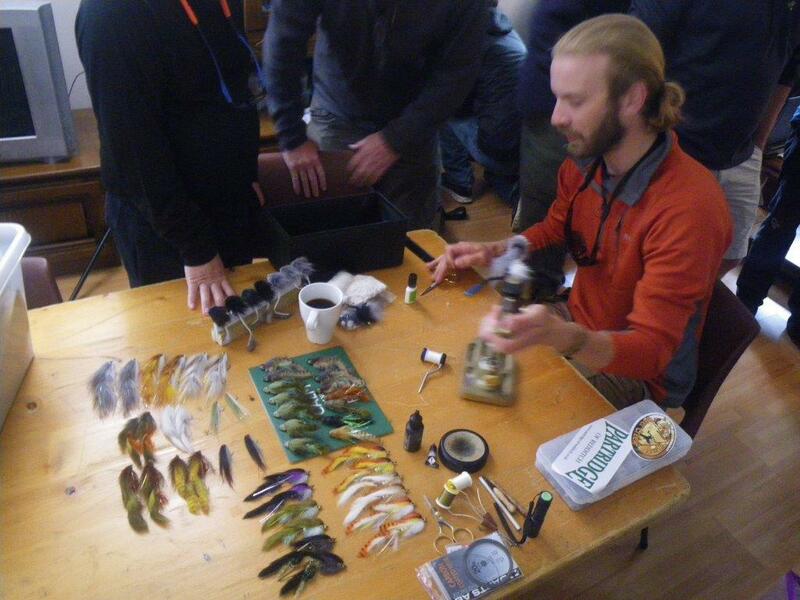 When a grayling showed I naturally presented my fly and often succeeded in landing af fish. 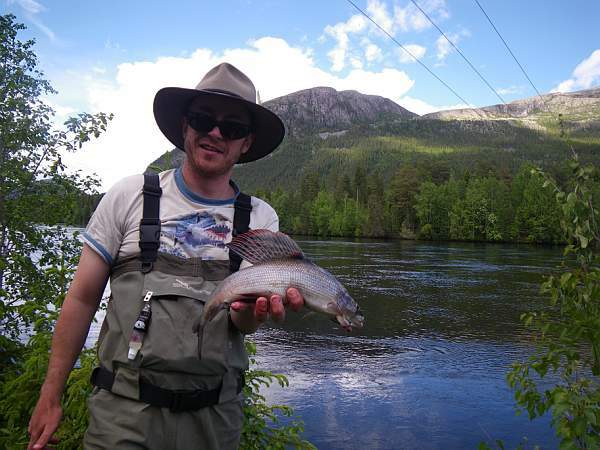 The grayling quite big as you rarely catch fish below 40 cm and the average fish is 45 cm and they are much thicker and deeper than the fish we get in Glomma. 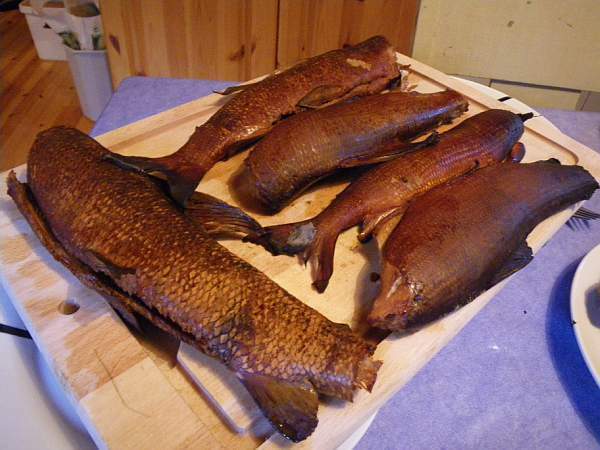 All the grayling and trout were released but one day Henrik fished for white fish to smoke so that made a nice meal one day. The other days we had to eat big steaks of wagyu beef and other delicious stuff. We must admit that the eating and drinking is an important part of the trip. We saw beavers on a regular basis. Normally for safety reasons the beavers nest has its door below the surface but with the low level of water that was spoiled. We saw most of the beavers in the evening so it was not easy to get a good photo opportunity so this is a more evidence of the beaver than a nice photo. 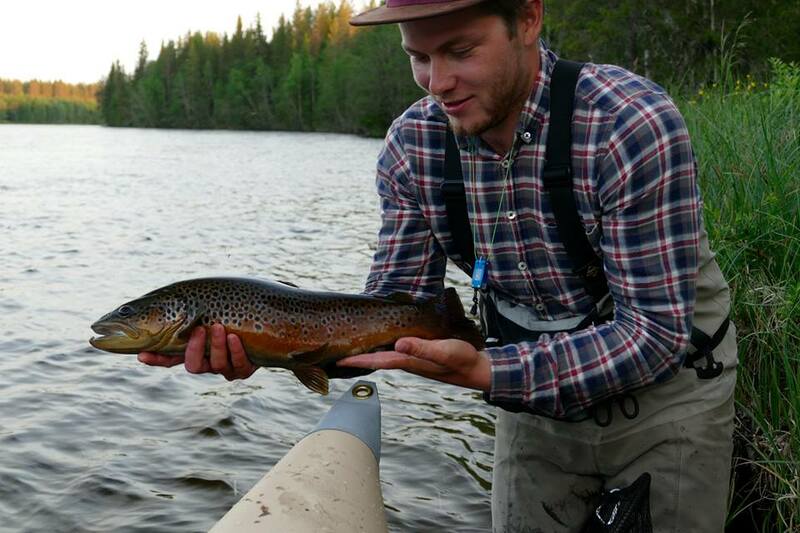 One day Henrik found a trout sipping mayflies and he got a real beauty around the 58 cm mark. Release of another nice grayling. One of the nicer trout caught just before we stopped the fishing one night. Despite the low level of water we had some very good fishing with the dry flies and we like always had a blast with lots of laughs and we will come back one way or another again. 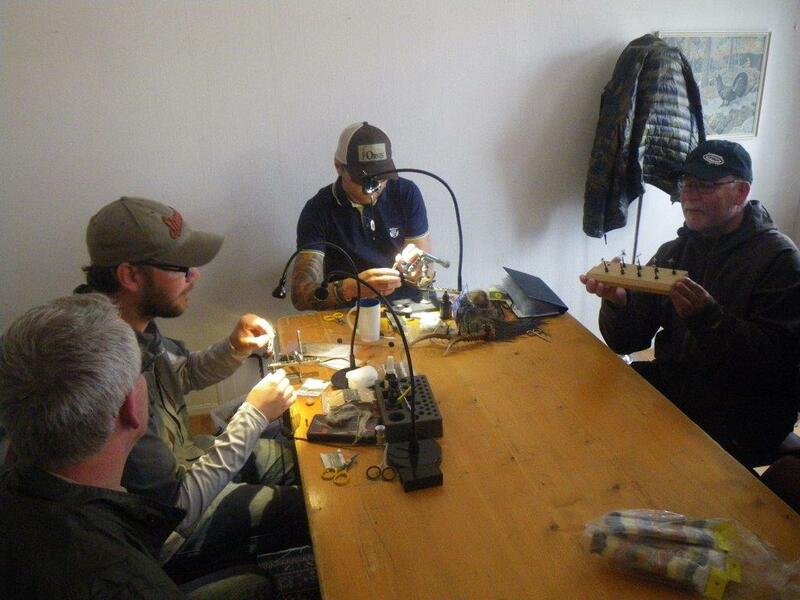 Like last year a week planned for dry-fly fishing at Rena drifting from pontoon boats. This year I was joined by Henning, Anders, Gunnar, Inge and my wife Lise and we all had pontoon boats. We stayed at Rena Fishing Camp where the plan was to fish, eat drink and have a lot of fun. 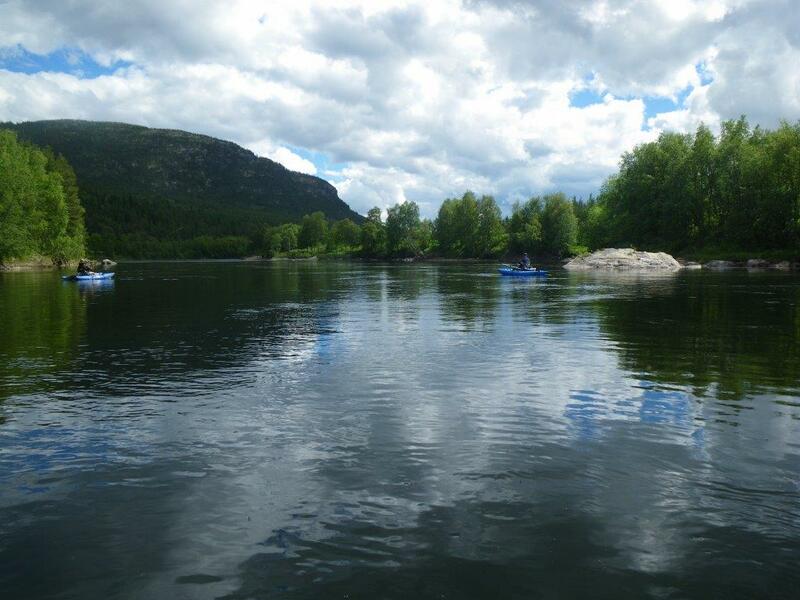 Rea is a beautiful river but a lot of places it is hard to wade fish and that is one of the reasons we are very fond of drifting down the river. 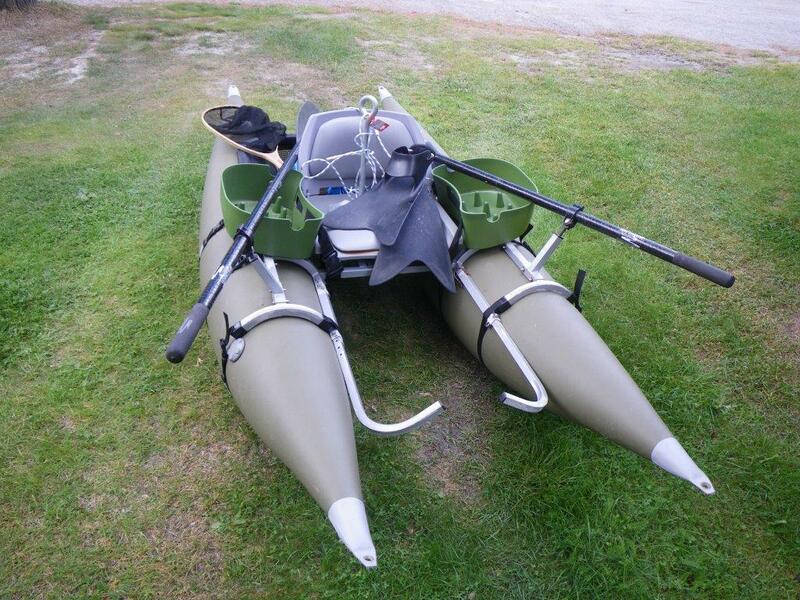 it also adds variation to the fishing but when you do not anchor up you only get ones shot at a fish. 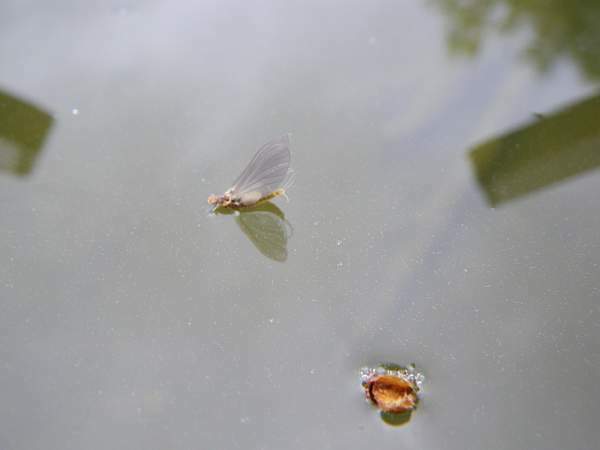 We fish to fish that feeds at the surface but we also blind fish with dry flies and that can be quite productive when you have learned where to do your fishing. 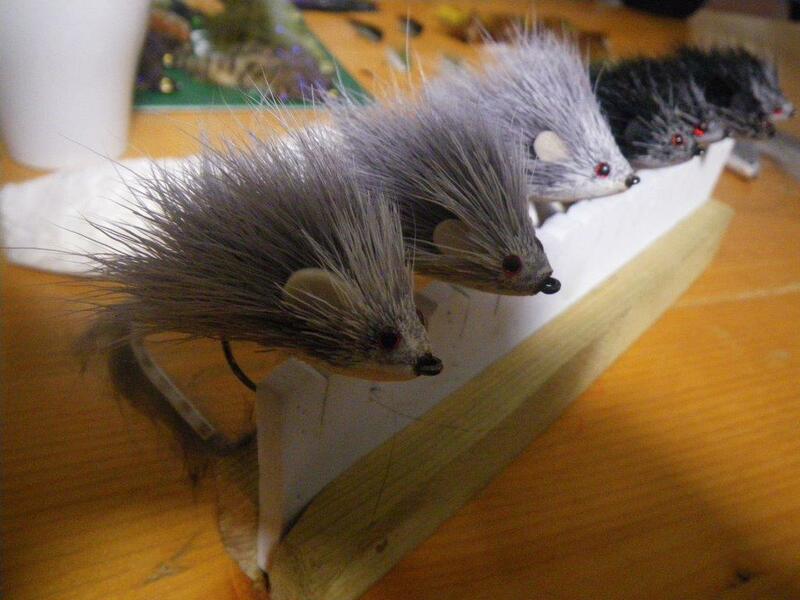 The trouts are wild thoiugh some fish are stocked and they are marked with the fat fin cut off. 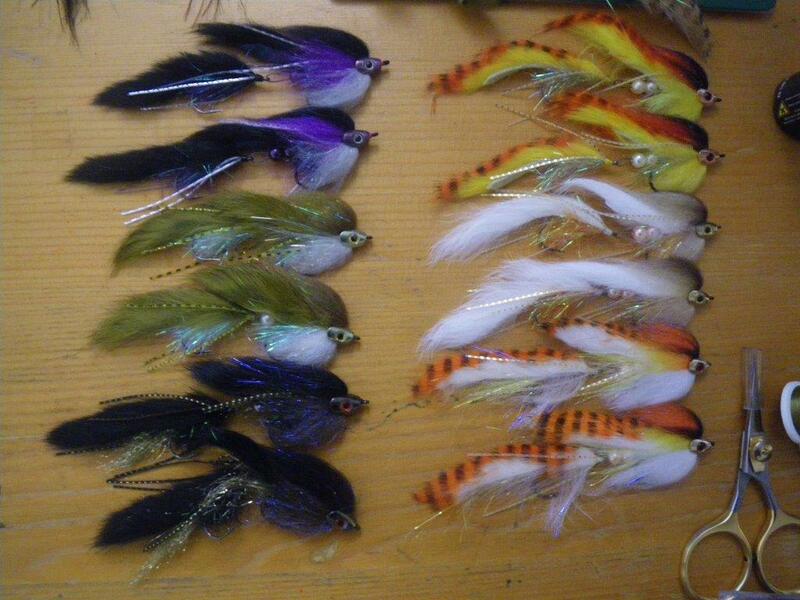 I have now caught probably more than 200 trout and still haven´t seen any stocked trout. 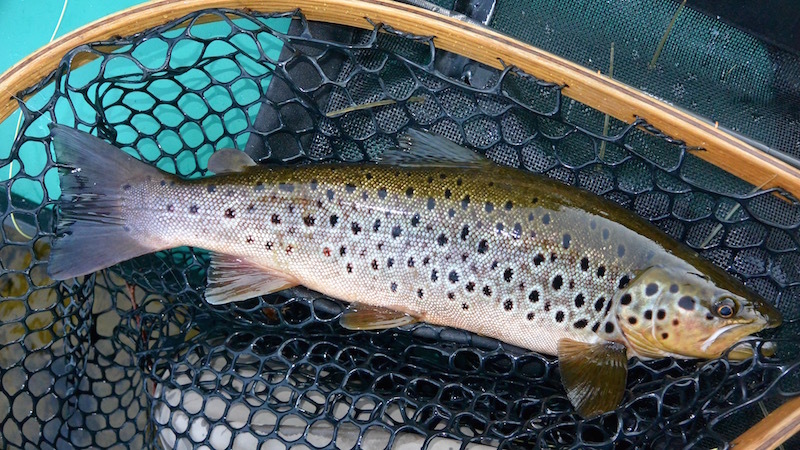 The largest trout are caught at nighttime but we did not fish in the dark so for us nice fish are in the 35 – 40 cm range. I normally fish primarily for trout but when I see a grayling I go for that as well. 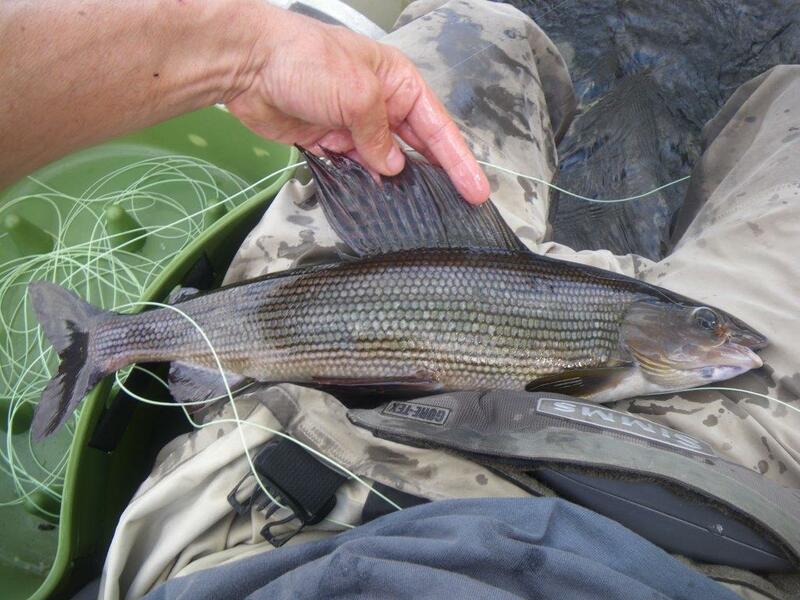 The average size for grayling is very good as it is around 45 cm. 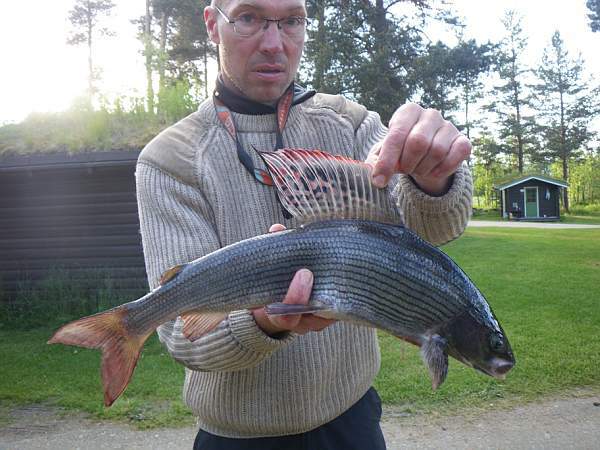 You may kill one grayling and one trout per day and they must be in the 30 – 40 cm range. The fly I used most of the time was Dyret or the Animal. 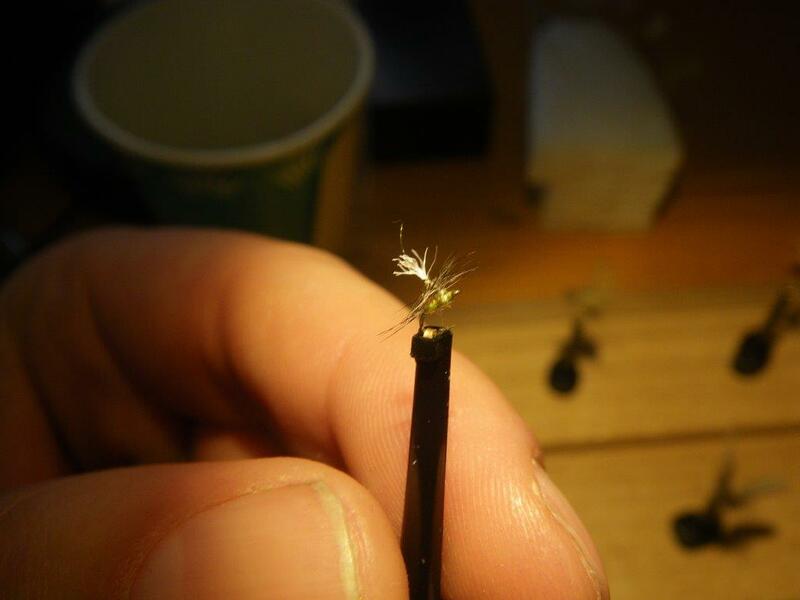 It is an imitation of a sedge or a stone fly, not anatomically correct but it works fine. When you want to release the fish and want a photo I seem to end up with two kinds of photos. One in the net..
or one in the hand. When sitting in a boat alone and wanting to release it as fast as possible I end up with a bit boring photos. We typically drifted 10 – 12 km so a bit of logistics were necessary everyday. We managed to transport all 6 pontoon boats inflated on two cars and a trailer. Inge managed to find a handful of big very good-looking and tasting Karl Johan, one of the best edible mushrooms and we had a fantastic starter one night. Everyday we started out with freshly baked bread. The eating is an important part of the trip. 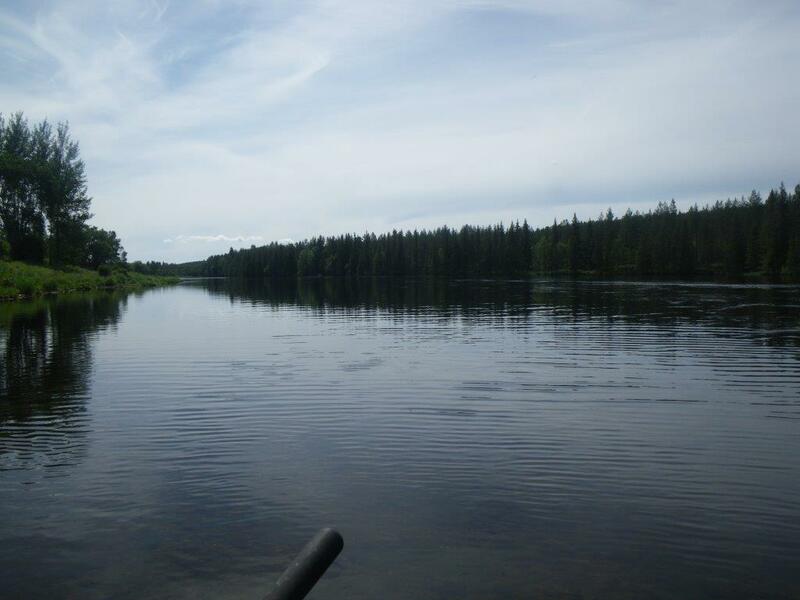 There are also many birds and we all also saw beavers so always a nice experience in the nature. ‘ The best fish on the trip was this 1,5 kg trout that I got in the afternoon after Gunnar promised two free flies to the biggest fish of the day. It was taken on a Dyret like most of my fish. We were lucky that the wind was very calm almost all the days and only one day rained away. We got a lot to drink and eat and had some nice fishing and a lot of laughs. I only paused one day du to my shoulders so that was Ok and I am sure we will come back next year. 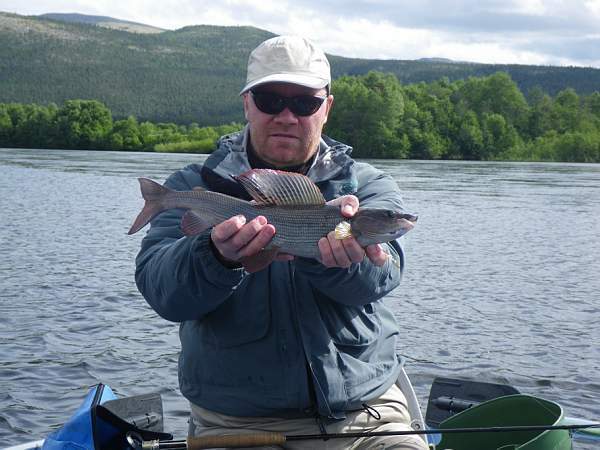 A week fishing in Alvdal in Norway which means in Glomma and in Folla. We were 8½ persons if Olivia (4 months old) counts as a ½. Besides Olivia it was Inge, Augusta, Henning, Harry, Anders, Gunnar and my wife Lise. 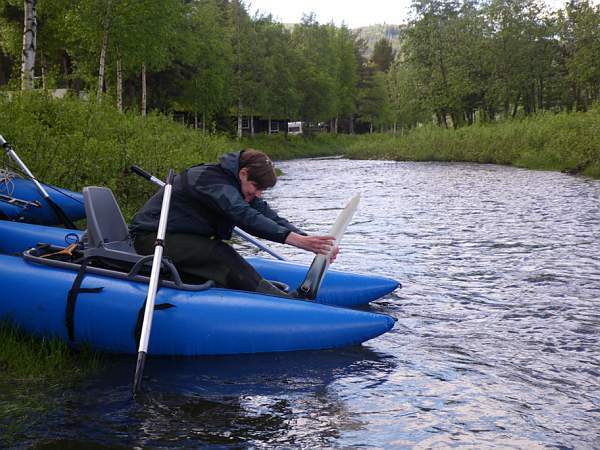 Most of us wanted to do dry-fly fishing from our pontoon boats as this earlier has been very succesful and very entertaining. 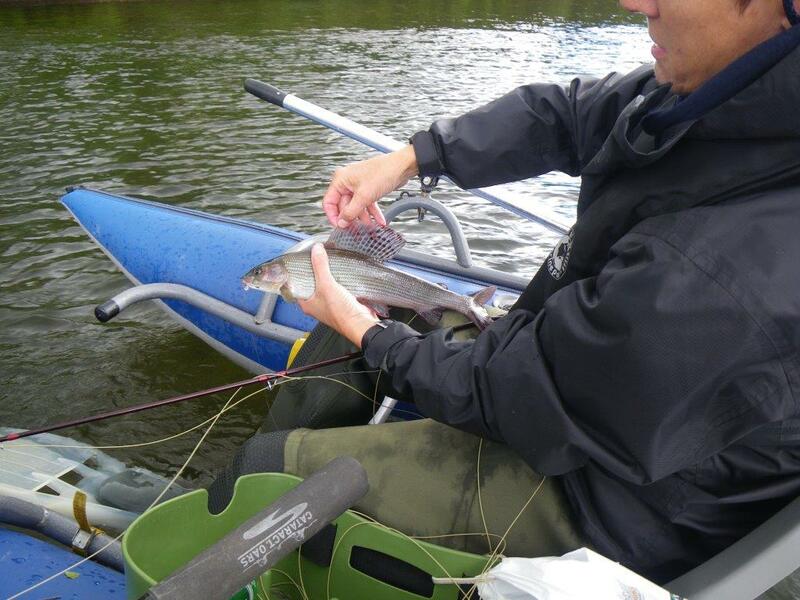 Here we mainly fish for grayling but trouts may also be around but in smaller numbers. The weather forecast was more or less awful with lots of wind and low temperatures. Lise entering the pontoon boat for the very first time – something you need to adjust to. 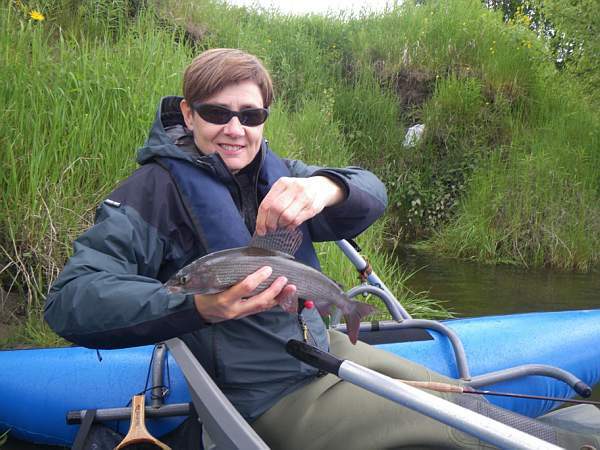 On her second trip Lise was quite familiar with the boat and could focus on the fishing and not without pride she called me to take a photo of her first grayling on a dry-fly. 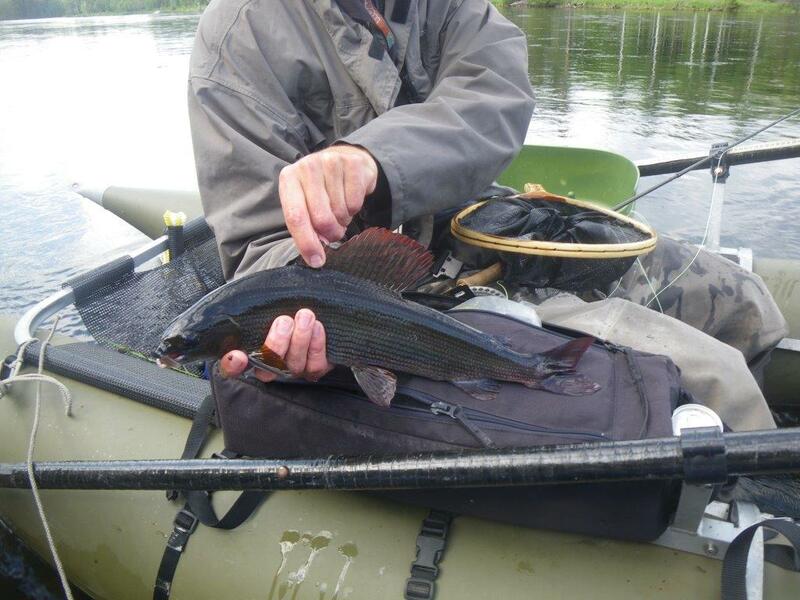 Here presenting the fish – a grayling around the 15½ inch mark. That night we had smoked grayling for dinner. 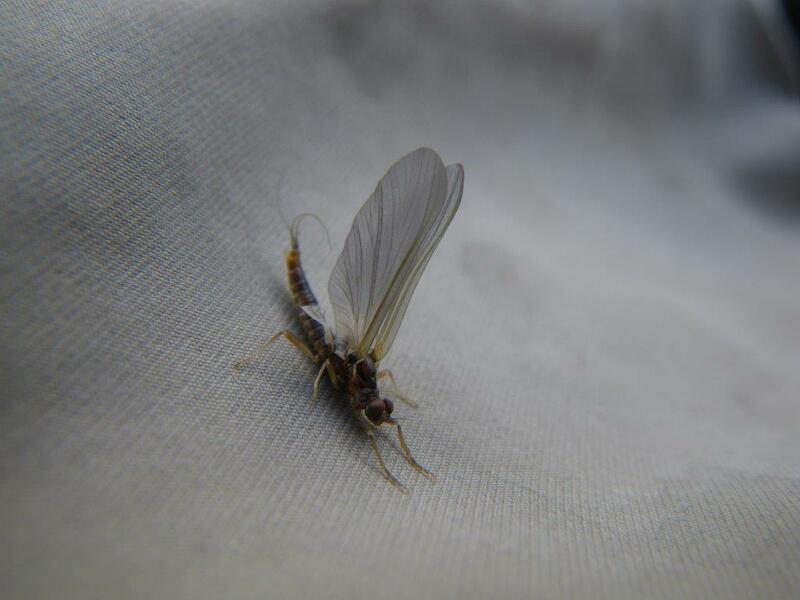 after 4 days we finally got some warmer days with less wind and the fishing then really improved as there were more insects hatching and it was easier to see the fish and to cast for them. 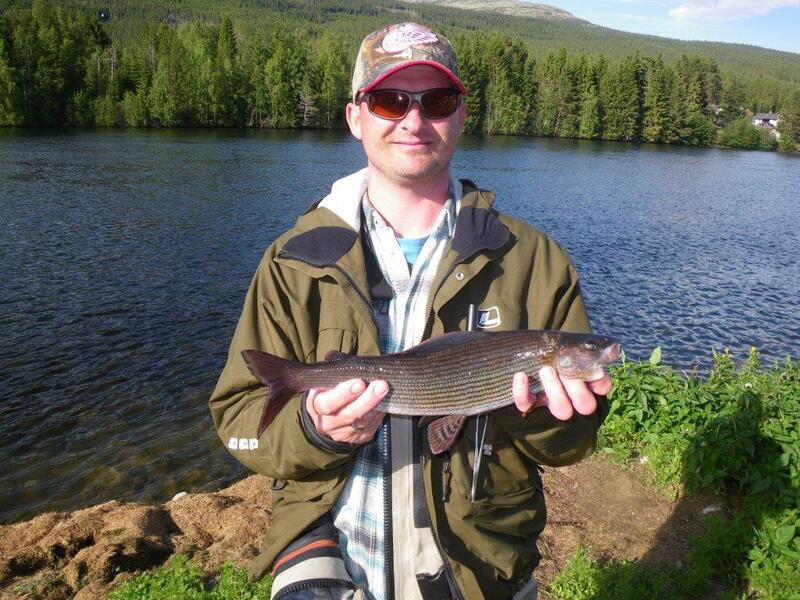 Soon after his trout Henning also landed this 17½ inch grayling so everything went his way this day. 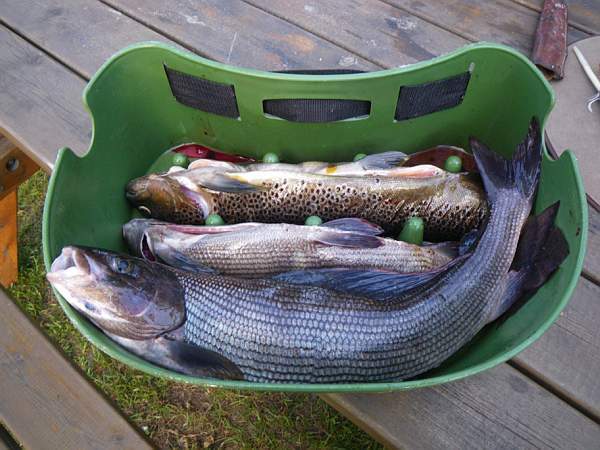 That day we brought back a nice basket with fish for dinner and lunch despite we only killed a very limited number of fish of the fish we caught. 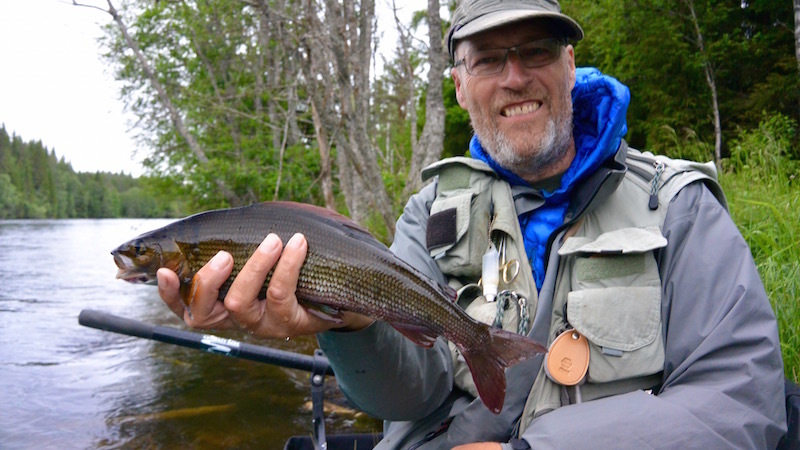 The largest grayling on the trip – a 20½ inch fish. The dorsal fin has fantastic colours that looks even better in the water when the sun is shining. The last day was quite cold but there were many small mayflies and many fish showed to this buffet. 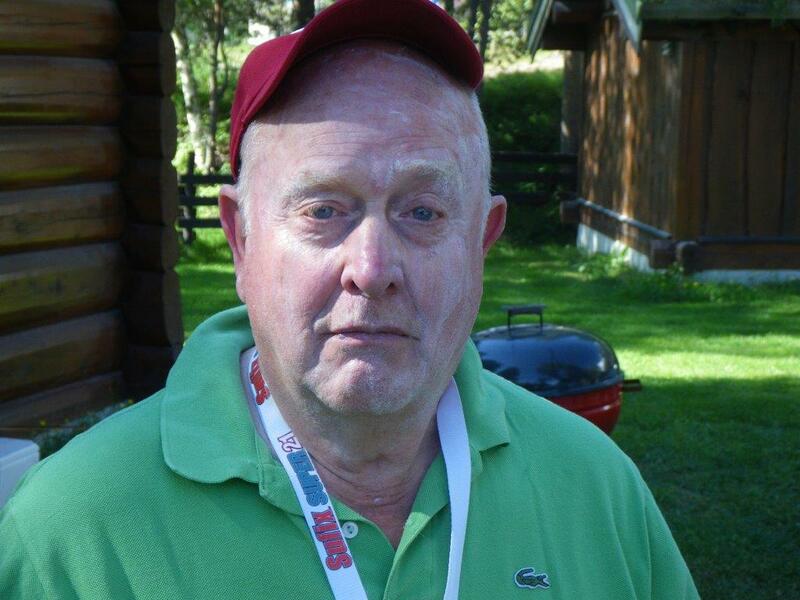 That day I got around 15 fish with 2 in the 18 inch range and many other good-sized fish. 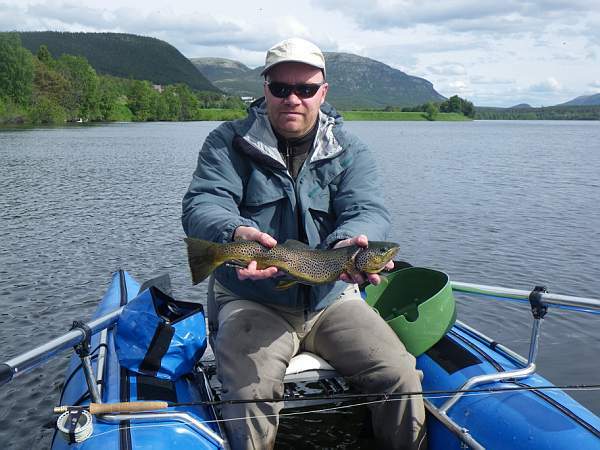 Inge despite being norwegian and a fly-fisher had never fished for grayling before as they are eastfish to him coming from the northwestern part of Norway. But here he presents one of his graylings in very nice surroundings. After a week fishing we were content and had our share of the action. I got more or less 100 graylings and two trouts. I also three times saw beavers and one otter and a crane. 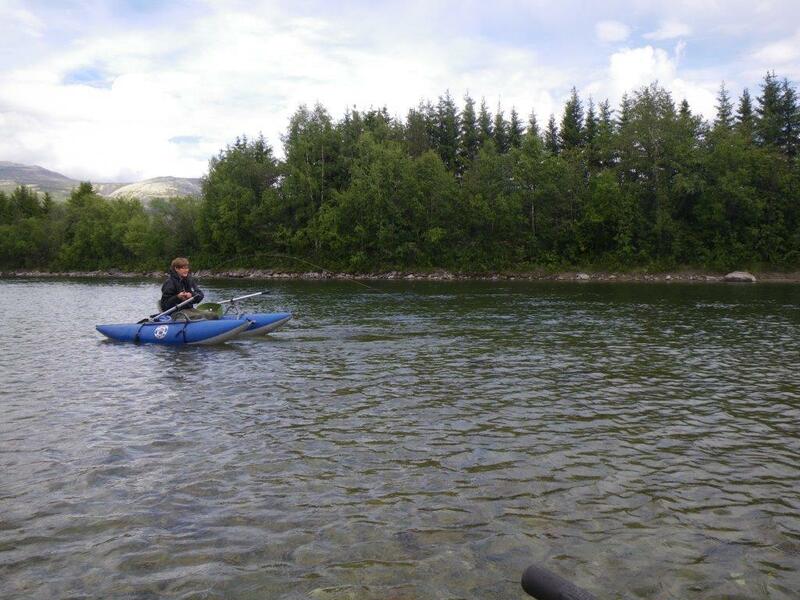 I was also very happy that Lise caught fish on the fly and really enjoyed the fishing and the rafting in the boats so there may be another pontoon trip next year.